This funky purple foundation brush lets you have a blast while creating your base. With its well-crafted shape and premium bristles, you can apply product with confidence and ease. Its bristles are made with new cutting-edge technology and cruelty-free materials to develop the ultimate professional vegan makeup brush. 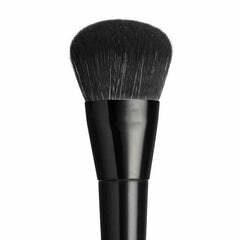 This high quality foundation brush helps you achieve those stunning red carpet features. Its flat shape allows you to define, sculpt and buff your way to flawlessness. Use it all-over your face as a foundation blender to create a flawless complexion or as a contouring brush to add definition to the cheeks and jawline. You can also use it as a professional body enhancing tool to sculpt your abs and décolleté. With its multi-purpose wonders, it’s truly the MVP of makeup brushes! 19.4cm full length. Bristles - 3.2cm high, and 2.7cm wide.